I’m a firm believer that all plants are beautiful in their own way. I’ll spend just as much time admiring cabbages as roses. However if you live somewhere with a lot of restrictions whether they’re from the town or home owner’s association it can be devastating to read rules about what your yard must look like. Growing your own food is hard enough without trying to keep up with the neighbors. This list of beautiful vegetable varieties can help you get food production out of an ornamental bed. We also have a list of edible and medicinal flower varieties that can help you get double duty out of any flower beds! You can find that here. Many greens are pretty but few have the stunning color and hardy, upright nature of rainbow chard. They’ll easily fit into an ornamental or flower bed and can be selectively trimmed to keep the garden looking full and still provide harvests throughout the season. From spicy bush basil to dark opal basil, it comes in a wide range of styles that can be added to any garden. Their are many gorgeous lettuce varieties that can easily be snuck into the border of a flower garden. Some ideas include: Yugoslavian red butterhead bibb, Mayan jaguar lettuce, or red sails looseleaf. While chives aren’t quite as big as some ornamental alliums they still offer beautiful blooms. They also stay good looking and can be harvested all summer long making them a great easy maintenance choice. During the spring harvest period asparagus is small and rather inconspicuous. However later in the summer it grows into large showy fronds. They’re truly gorgeous and most non-vegetable gardeners won’t recognize them as asparagus at all. 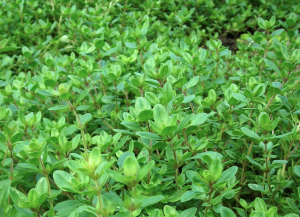 This herb is useful, fragrant, and a wonderful sprawling ground cover. Amaranth is often used as an ornamental but it can also be used as an edible green like spinach when young and tender and produces grain when it’s fully mature. Depending on how strict your area is not all peppers may be acceptable. 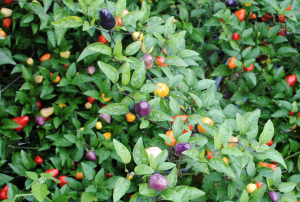 However there are several varieties like the ornamental Chinese five-color hot pepper pictured above that are still edible but offer a lot of beauty. Curled parsley like moss curled or forest green varieties can be used to add a lot of texture to the garden. Peas have lovely flowers and leaves brining their beauty to the landscape early in the year. Also because they grow on a trellis they’re perfect for adding height to a garden or squeezing in some edibles crops when you have limited space. Like peas, scarlet runner beans add dimension and beauty to the garden. They’re also very heat tolerant. All tomatoes are pretty but there’s a few varieties that offer a unique touch to the garden. Try bicolored varieties like green zebra, big rainbow, or striped roman for an unusual touch. Plan your garden well. 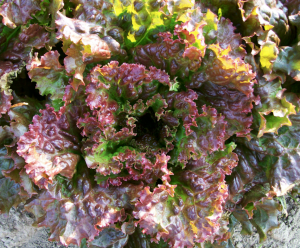 Lettuces and other greens planted in a design or among other ornamentals will fit in with flower gardens much better than traditional rows will. Keep your garden well maintained. A weedy or poorly watered won’t be appreciated in your neighborhood no matter what varieties you planted. Give your garden variety. Adding plants to your garden with different heights, colors, and textures will add a lot of interest. Edible landscaping can be beautiful! Even if your neighborhood has strict regulations regarding vegetable gardens, chances are you can still squeeze in some edible plants. 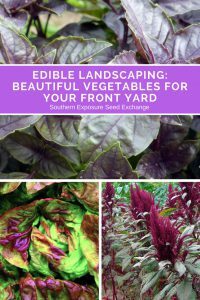 These are just a few ideas of edible plants that will fit into any ornamental garden.